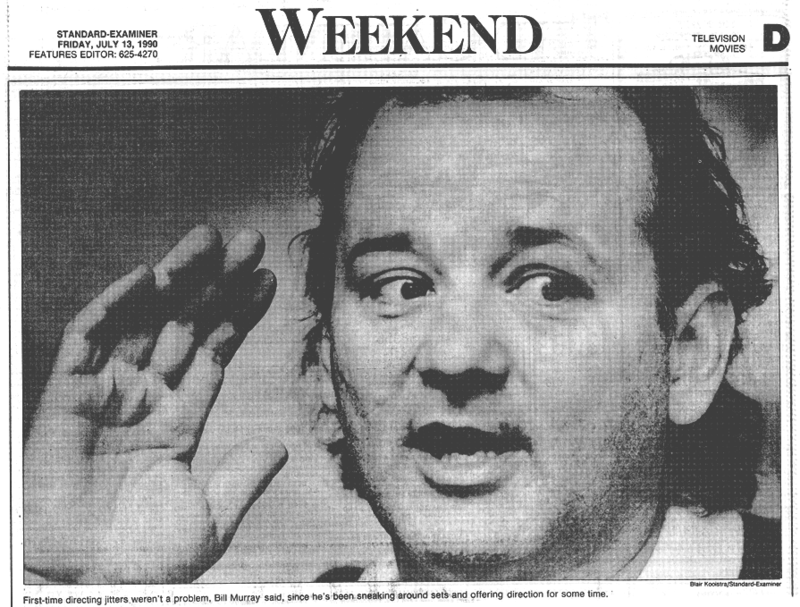 I interviewed Bill Murray at the University Park Hotel in Salt Lake City. When I arrived in the lobby a few minutes early, I sat on a chair and opened my notebook to jot down a few topics I wanted to discuss when I was summoned upstairs; I was the first interviewer of the morning, with Chris Hicks (Deseret News) and Terry Orme (Salt Lake Tribune) to follow. After only a minute or two, I heard some one saying loudly, "Don Porter. Calling Don Porter. Don Porter, please report to (whatever floor it was)." It was Bill Murray standing at an upstairs railing. Apparently he got such a kick out of it, Chris and Terry told me he did the same thing with them. SALT LAKE CITY -- It's 10 a.m. and the first thing Bill Murray does is apologize that he hasn't been awake long enough to clear the cobwebs from his brain. He ambles up the hotel hallway, baseball cap on his head, wearing a windbreaker, jeans and loafers. He extends his hand, looking straight into his visitor's eyes and leads the way to his suite. In desperate need of a shave, he dispatches his minions to score a razor. Something double-bladed, preferably. Shortly thereafter, a photographer appears. Murray responds with dismay. "God," he exclaims, "I hate to have my picture taken." Immediately, he's up off the couch, searching through his luggage and eventually pulling a dark-colored sweater on over his white shirt. "Nobody told me I was going to have to get dressed for this interview." The sweater hides his disheveled shirt, but it doesn't do much for the tangle of thinning hair on his head or the day-old stubble on his face. Which, apparently, is fine with Murray; it's part of what people like about this actor who wears his Everyman persona so comfortably. The "Ghostbusters" star is in Utah this sunny mid-June day to watch the Salt Lake Trappers' home opener against Idaho Falls; he's part owner of the team with a few friends and his older brother, Brian Doyle-Murray. ("My brother owns a couple of bases and one of the bats.") And since the actor has a new movie, "Quick Change," bowing in theaters soon, he's consented to sit for interviews before heading to the ballpark. Murray has never cottoned to publicity, which he labels "false fuss." When he has submitted himself, writers and broadcasters have often called attention to his moods, which vary from quiet to reserved to confrontational to dark. Today, his mood is mostly bright. He is excited about the way "Quick Change" turned out. In addition to starring in the crime-caper comedy with Geena Davis, Randy Quaid and Jason Robards, Murray debuts as producer and co-director with Howard Franklin, who wrote the screenplay based on Jay Cronley's novel. Murray has been enormously successful as an actor in other peoples' movies. So the logical question is, "Why direct?" Simply, Murray and Franklin had been working together on the screenplay, and decided they didn't trust anyone else to direct it. The neophyte directors nabbed Bob Greenhut, who produces Woody Allen's films, and took to the streets of New York, using Allen's crew. "Ours was not the Gray Line tour of New York," the actor-director says, describing the shoot locations as similar to battlefields. One night, shots were fired. The gunfire, Murray says, involved a carload of hooligans who fired a bullet into a van, narrowly missing the head of a crew member. "That's good for morale; keeps the crew tight." Murray says the crew, used to working on Allen's pictures in midtown Manhattan, were taken aback. "I mean, they work locations from the Plaza to the Carlisle. 'Could we get that lady with the dog out of the shot? That's the extent of the danger they get." First-time directing jitters weren't a problem, Murray says, since he's been sneaking around sets and offering direction for some time. "I've been secretly doing it for years. ... If the director doesn't know what the hell's going on, I just sort of," and he pretends to take someone aside surreptitiously, " 'You know, what you should really be doing is this.' "
Knowing your way around a movie set, though, doesn't make the job any easier. Post-production on "Quick Change" was finished only two weeks before, the filmmaker says, and he's still recuperating from the ordeal. Directing a film is "terrible -- just really the worst. I was literally thinking I can't go on, up until two weeks ago. ... I always thought it was like four times more work being the director," he continues, laughing. "You can't even compare it. It's just ridiculous. It's the difference between being a child and being a parent." Add the chore of acting, and he trots out words like "brutal." Murray says directing was something he had to do, and that the experience has not only made him a better actor, but "probably a better person, too." "I'm gonna be a more responsible actor," he says, removing the plastic wrap from the top of his room-service coffee mug. "I used to do a little bit of lounging: 'Yeah, I'll make 'em wait.' "
He leans back and takes a casual glance at his watch to illustrate his point. " 'Yeah, it'll be a while before I'm emotionally ready, know what I mean?' "
It's Murray's laid-back, detached insincerity that has been so appealing to moviegoers all these years. In The New York Times director Sydney Pollack, who cast Murray in "Tootsie," described the actor's talent this way: "He's got a complex and original range that puts him in a special category -- a completely believable comic illuminator." A prime task facing the star of a big screen comedy, Murray says, is staying in a good mood during the entire shoot. It affects the film in significant ways, and he admits it's been hard for him to accomplish. "It's very hard work. There are a lot of funny people who say, 'Oh, I could be in the movies.' Oh, yeah? Just try to stay in a good mood for a whole week. That's hard." After "Ghostbusters," in 1984, Murray left the business for what amounted to a four-year sabbatical -- the lone exception was the cameo in "Little Shop of Horrors" -- before returning in "Scrooged" in 1988. The Chicago native spent the extended vacation with his wife, Mickey, and two sons, Homer and Luke, traveling through Europe and visiting family. While the actor was on holiday, the price studios were willing to pay for his services kept climbing. 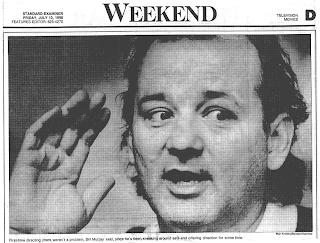 When he signed for "Scrooged," according to The New York Times, his paycheck was $6 million ($8 million, according to BusinessWeek). And upon his return to the movies, journalists began writing almost as much about his financial dealings and the commerce of his films as about traditional artistic considerations. Murray sees this fascination with star salaries -- and the topic of money in general -- as a byproduct of the Reagan era. Murray's buoyant mood drops a few notches as the topic of money is broached. When asked how he regards the press coverage of his salaries, he says in a flat, even tone: "I never made any movie to make money." When he reads stories about his "Ghostbusters II" deal -- for which he reportedly received $25,000 up front against 15 percent of the studio's take on gross receipts -- he says he thinks journalists are "missing the point." "Why did I make that movie?" he asks, rhetorically. "I turned it down for five years. I said, 'No, I don't want to make another.' But, you know, we got back together one day. Who brought us back together? The agents. And we actually had a lot of fun. ... So they made a story that sounded right, sounded good. But by the time it got written it wasn't that same story. "Not that it was all the writers' fault, it was more the director's fault. We really thought we could make a sequel that was good enough, you know. But it ends up being, you know, some goofy monster thing. ... That slime thing was supposed to be about something. But then it became ... about the slime." Murray has played both sides of the fence in money matters. He has appeared in movies for no salary. He reportedly did "Tootsie" in exchange for one of Dustin Hoffman's percentage points on the profits, and he confirms he worked for 10 months on "The Razor's" Edge" script in addition to starring in the film on a similar profit-participation deal. If talk of money seems to take the smile off Murray's face, when the conversation shifts to the late '70s and his years spent in the cast of "Saturday Night Live," he becomes slightly agitated -- especially when the observation is made that many of the old "SNL" skits might be funnier than most of the movies made since then by former cast members. "Nobody understands how much easier it is to write a five-minute sketch than a 90-minute comedy," Murray explains, his voice rising. "And we had the nation's ear, you know. ... There's something about that confidence that (the audience is) there -- it's not like a movie or anything where people might not go." Murray calls the "SNL" combination unique, saying it was good because the mixture of actors and writers gelled. With movies, he says, there's an uncertainty that pervades everything. "What if nobody goes to see this movie?," he asks in reference to "Quick Change." "It's a well-made movie, and I like it. It's not 'Cinema Paradiso,' or anything -- I'm not pretending it's what it isn't. It is bank-robbery movie." Murray has almost always made lightweight entertainments. It's what he does. His one exception, "The Razor's Edge," was a foray into drama that resulted in major critical and box office failure -- the only bomb to date that he's starred in. "Well, it doesn't hurt me much anymore," he says, his voice dropping to a mere whisper. "I probably should have made that a modern movie; it shouldn't have been a period piece. What was appealing about it was that it was a modern theme -- I did know all those people who went to war and came back weird. You know, became junkies, drug addicts and stuff. "It was a great experience. The material still is fascinating. I'd love to make it again in 10 years. I just did it and I worked on the script and I went all around the world; I went to the Himalayas and I went to Paris and I had some experiences I never would have had. And that's what movies can be -- they're not about great successes and winning Oscars, they're about taking a chance on something ... ."